KY International places a strong emphasis on the proper master planning of large scale projects, believing that quality planning leads to quality developments. In association with world renowned planning firms, land use, urban and infrastructure planning are designed with a comprehensive knowledge of the past, present and future demographics of the area. The ability to envision a development’s concept on a macro level enables KYI's planning team to realize the projects potential on a physical level. KYI’s portfolio of projects range from a mixed-use development on 9.5 acres of suburban land to a jointly designed marina development on 2,500 acres of waterfront property. Stretching along three miles of prime waterfront real estate, Vision City will be a modern, global financial capital complemented by world calibre attractions and a vibrant waterfront community in a lush tropical garden setting. Stretching along three miles of prime waterfront real estate, Vision City will be a modern, global financial capital complemented by world caliber attractions and a vibrant waterfront community in a lush tropical garden setting. 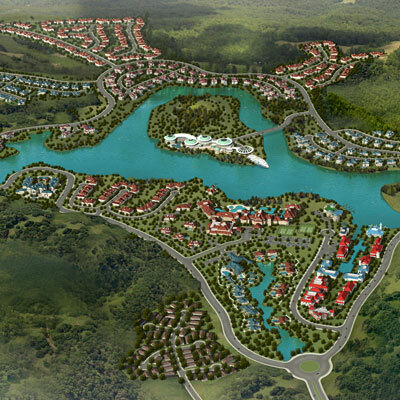 An exclusive, ecologically-centered mixed-use development set on the banks of a lake in a lush valley just outside Xiang Tan Shi city center. Luxuriously designed on the forested banks of pristine waterways in a secluded valley, the development will be the finest resort community in the region and a coveted weekend getaway spot. The site’s tranquil setting and natural beauty make an ideal location for a new residential community. Tucked into the lush mountainsides around the resort will be the Eco-Health Residential Development, comprising an exclusive resort community of villas and apartments. The resort community will promote sustainable practices and healthy, wholesome living. This modern fishing harbor center will be developed along beautiful protected waterways with dining, shopping, entertainment venues, beautiful public art, residential options and housing built specifically for local fishermen and their families. Represents a new vision of residential-resort development that skillfully blends the spectacular modern resort and condominiums, the small-scale European styled neighborhood villas and the bucolic farmland setting into a fresh contemporary community. Located on Lantau island, this naturalistic park flows seamlessly into the adjacent Hong Kong Country Park. Discovery Bay features a chronological journey through the garden history of the world, enabling visitors to discover and enjoy a variety of landscape settings and styles in a compact tour.